If you missed my post from yesterday about making Jolly Rancher flavored popcorn balls, make sure to check it out. Using this same Jolly Rancher Gelatin mix that I talked about in that post, it inspired another idea. I thought to myself, “why not try to make hard candy flavored with it and see what happens”…so I did try it… a few times, because I had to work out some kinks (whether it be texture or flavoring issues) before I shared it with everyone. 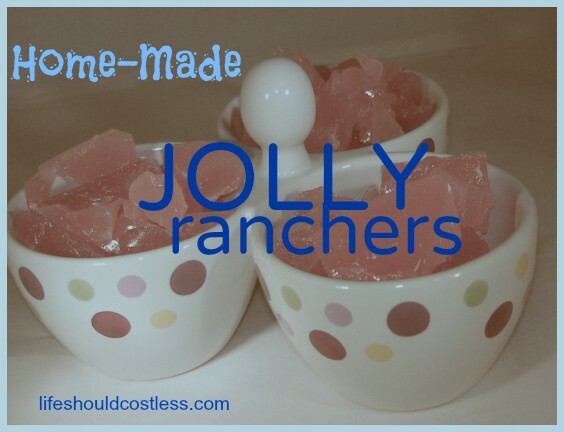 This is definitely one of those things where you could always just go to the store and buy some Jolly Ranchers, but sometimes it’s fun to make your own sweets, and this is definitely a new twist on an old favorite (home-made hard candy that is). Anyway, I started out with a basic recipe for hard candy and tweaked it a bit to make it work and not be grainy or void of flavor. I hope you enjoy it! (I’ve never used a candy thermometer so use the link to see what temp you’ll need). This part can take up to a half hour or so, so please make sure you are being really careful. I always make my (small, ages 2 and 4) kids leave the kitchen during this part because of potential danger. While the mixture is boiling get out either a cookie sheet or a couple of smaller dishes and butter them in preparation to pour the candy into. I like to use two glass pie “tins” as it makes it just the right thickness that I like. Stir until the gelatin has mixed in fairly well and then return it to the heat. Once it starts boiling again I usually set a timer for 3 or 4 minutes and let it sit and boil. This gives the sugar in the gelatin enough time to dissolve, but it’s not so much time that the flavor is lost. Once you are happy with the amount of dissolving the gelatin mix has done, pour it into your prepared (buttered) pan/dishes. Let it cool in room temperature open air. DO NOT ATTEMPT TO REFRIGERATE to speed up the process, it can ruin your candy. Just make sure it’s not where anyone or anything (pets) can get to it and burn themselves. It may take up to a few hours for it to cool and completely harden. Once it’s hard, break it into small pieces and enjoy. as well. It’s way cheaper at Winco, but if you want the other flavors Amazon is the only place I’ve seen them at so far. Did You Know You Can Pull Taffy in a Bosch Mixer? Plus A Recipe for Jolly Rancher Flavored Taffy.